If you pass our offices in Godalming you may notice the striking blue cow grazing outside. 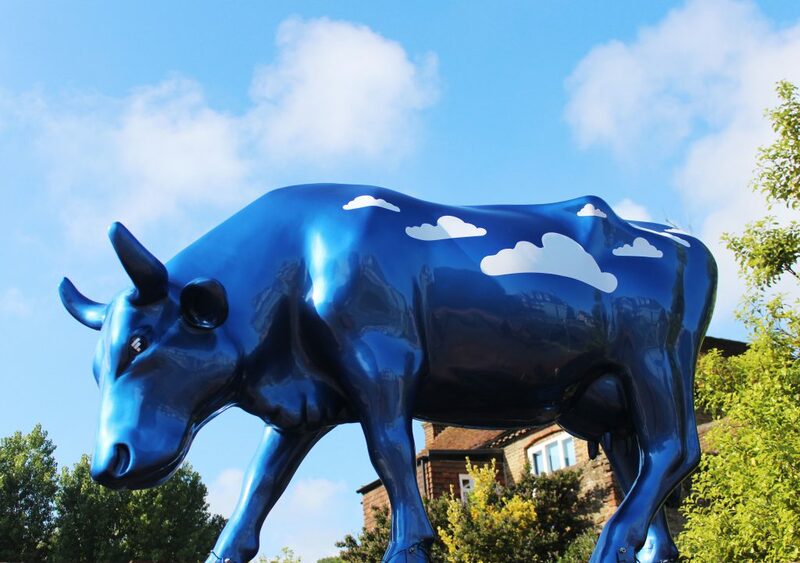 Ermincloud, who has become something of a local landmark, was sponsored by Fordway in the 2016 Surrey Hills Cow Parade, part of the world’s largest public art event. The Fordway team became quite attached to her and Richard Blanford the managing director decided to bid for her at auction (and win) where the funds raised went to local charities including Fordway’s nominated charity Eikon. Eikon is an award-winning charity, which provide long-term support to some of the county’s most vulnerable young people. Fordway continue to support their work with fundraising activities such as sponsored entry in events like Ride London, bake sales and even a sponsored abseil! Fordway chose local designer Lisa Scott of Lisa Jayne Interiors to decorate its cow ‘Ermincloud’ with a cloud-inspired theme. Lisa is a Surrey based interior designer and decorator with over 20 years’ experience across a wide range of projects – although she had never tackled a cow before! Lisa had great support from local businesses too. Steve Scott at SS Mobile Auto Refinishing supplied paint and local scaffolders Scorpion Scaffolding erected the scaffold to support the cow.